My friend Tim and I had three weeks vacation available that we had to use before the end of year or lose them. Tim left the decision as to where we would be going up to me. So, on a whim, and after an hour spent with the travel agent, I called Tim up to give him the news. “No Clue,” I replied honestly. It was the truth, I had no idea what Brazil was going to be like. The flights had been a special deal and I wanted to amaze Tim with a destination that would be a bit different from the norm. One week later we met each other at Heathrow. Tim was already dressed in shorts and t-shirt, despite the outside temperature barely above freezing. Twelve hours later we landed in Rio de Janeiro, and figuring we’d play things by ear, we booked into a hotel for two nights while we sorted out what exactly we were going to do in Brazil. We sat on the beach at Copacabana and perused the Travel Guide that we’d picked up at the airport before our flight. The more we read, the more we realized that three weeks were probably not going to do Brazil much justice, but we vowed anyway to try and fit in as much as possible during our stay. Our first stop was Manaus, the gateway to the Amazon, and a few hours flight from Rio. After setting ourselves up in probably the swankiest hotel I’ve ever stayed in (it even had a private zoo), we prepared to head into town to find a guide who could take us into the Amazon. Luckily for us we didn’t even have to go outside the hotel’s front gates before we met a Japanese couple who were themselves were returning from the jungle after six weeks. The couple quickly introduced us to their guide, Paul. Tim and I quickly debated whether we should snap him up or shop around for the best price first. In the end, the fact that Paul had managed to deliver the couple safely back to civilization unharmed proved to be the strongest argument for hiring him. The only thing left to do was to haggle over the price. We met Paul the next day a local bar where was with his entire extended family. After treating his family to a few rounds of beer — and after a few ourselves — we didn’t think twice about handing over a considerable amount of money to Paul in the men’s washroom, while his two uncles kept watch at the door. After crawling into our beds at four the next morning morning, we made our way to the jetty for a six o’clock getaway. Being slightly late, we were relieved to find Paul, his boat, and his uncles, still waiting for us. The old boat, christened “Tug” by our guide, took us up the Amazon for two weeks, and in this time we witnessed and experienced all manner of things. Flying fish jumped straight out of the water and onto the boat (no need for a hook and sinker here), while we fished for piranha off the back of “Tug,” using more traditional methods and watched as a couple of pink dolphins swam lazily off our bow. Halfway through our excursion, we spent a few days exploring the jungle itself. Although we spotted several enormous Tarantulas and were almost attacked by a bunch of wild monkeys while we slept, there were only two moments when I actually felt any fear. The first was when Tim, still reading the Travel Guide, reached the part about malaria being rife in the Amazon, and no, we weren’t on any anti-malaria medication. The second came in the dead of night, when I had to look for a place in the Jungle to go to the toilet, while Tim kept guard just in case anything nasty decided to attach itself to my exposed backside. After two weeks in the mazon we flew from Manaus to the smaller town of Iguazu, home to the magnificent Iguazu Falls. Iguazu is unique in that Brazil, Argentina, and Uruguay all converge at the falls, and to fully appreciate the falls you have to see them from each of the three countries. After spending the first day at the falls from the Brazilian side, we crossed the border into Argentina and spent the second day on that side. From the beauty of Iguazu, it was onto Brasilia for half a day before returning to Rio for the last few days of our trip. The initial plan, made after our arrival in Brazil, was to use the last few days in Rio to recuperate on the beaches before we headed back to the dreariness of a British winter. However, once we got there, we found that we still didn’t feel like resting, so we tried to see how much we could possibly fit into our last two days. As it turned out, we could fit quite a lot. The next morning we were up early to go hand gliding over Ipanema beach with a Brazilian who held the world record for the longest uninterrupted hand gliding flight. 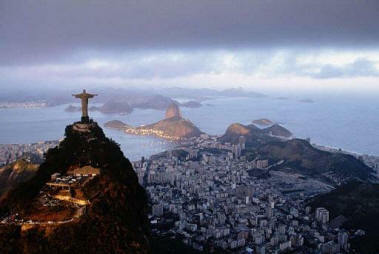 Next we ascended to the statue of Christ the Redeemer, which looks out over the city. This was followed by a cable car ride up Sugar Loaf Mountain where, while you are waiting to get onboard, they show a clip from a James Bond film where the cable car that you are in blows up and crashes into the side of the mountain. For those squeamish types it was probably best to look away at this point. Finally, we managed to take in what was sold to us as a traditional night of Brazilian culture, but clearly put on for the tourists. This “traditional” show consisted of a local Capoeira demonstration (a cross between Brazilian dancing and fighting); a schoolgirl juggling a football, and an old man crooning in the background. At least the food was good. Our last day in Brazil came and we both felt sad to be leaving. The weather had been kind and so had the people, and we recognized that in three weeks we had only just touched the surface of the country. Needless to say we both vowed to return someday, but for now Tim has the task of selecting our next holiday destination, and although something tells me that a lot more planning will go into this one, it will still be hard to beat our time in Brazil.